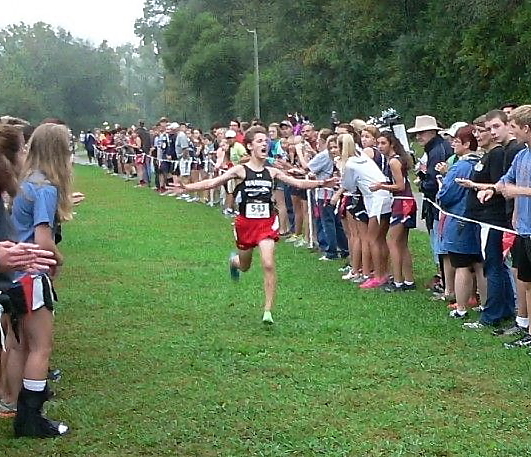 In the Boys’ Varsity race fewer than 20 points and 14 seconds separated the top four teams. Before today only Etowah had broken the 17 minute team average and today 4 teams were well under that time on the wet course.The competitors were pawing at the line in anticipation of the race and at the start they took off like a pack of hungry wolves. The early leaders consisted of Owen Bailey, Michael Perona, Parker Wall, Taylor Scarborough and Brennan Garriques who all went through the first mile in a water-evaporating 4:57. They stayed packed through two miles in 10:15 until Scarborough threw in a 10 second surge and took the lead with about 1200m left. Bailey and Garriques were the only two to respond, but the focused expression on Scarborough’s face showed he had no plans of surrendering the lead on his home course. With 20 meters left he glanced back to see he had a 30 meter lead over Bailey and Garriques and threw his arms into the air to celebrate his county championship and career personal best time of 15:46. Bailey outkicked Garriques finishing in 15:51 to Garriques’ 15:53. Perona finished 4th in 16:02 and River Ridge’s Ahmed Jama skipped his SAT and came on strong the second half of the race to take the 5th place spot in 16:08 earning him National Elite Status (Put that on your college application!). Etowahs’ Parker Wall faded back to 6th and finished in 16:38 finishing just ahead of Woodstock’s Corey Champion 16:34 and Cherokee’s Sam Harp and Zack Driscoll 16:35 and 16:39 respectively. 9th grader Zac Cantrell finished in a amazing 16:41 earning him on of the top 10 freshman times in the State. As has been the norm the last several years, the Girls Varsity race was between Etowah, Woodstock and Creekview with Etowah winning the majority the last decade. This year only 9 points separated the three with Etowah taking the title with 42 points. As predicted Etowah’s Kingsley Green and Woodstock’s Alexandra Melehan took the early lead and battled it out along the water covered course with Green holding on just enough for her second County Championship in 18:28, (slightly slower than her earlier Warpath time) while Melehan set her personal best time of 18:33. About 40 seconds passed before another runner came across the finish. In just her first year of XC Lauren Wallin of Creekview took 3rd with her PR of 19:12 beating out veterans like Cherokee’s Kaitlyn Farrell 4th and Etowah’s Shelby Rensel 5th, both National Elite runners coming into the day’s race. Woodstock’s Hannah Everest finished 6th in 19:58 and Creekview’s Rachel Boulineau out-sprinted Etowah’s Madison Fowler finishing one second ahead in 20:12. River Ridge’s lone top 10 finisher Kali Kimbell finished 10th in 20:27 between Woodstock’s Taylor Poole 9th place 20:25 and Etowah’s Julia Turbefield 11th place 20:28. In the last 10 years the rural Cherokee County has grown from 4 to 6 schools with each program producing some gifted runners and great teams and each one showing tremendous improvements to keep pace with the ever more competitive State competition. It seems that overall Etowah has dominated the county with an occasional victory by the other county schools, but this year 4 of the teams closed the gap to within seconds and points. In 2005 (at Boling) Etowah easily won both Varsity races with a boys’ team average of 17:57, and the girls average was a 21:11. Individually Daniel Sims of Etowah posted the day’s fastest time of 17:21 while his female teammate Kait Cook lead the girls division with her 20:18 time. (Those times would barely make the Varsity lineups of their program today). Comparing their 2005 Boling park times to today’s races the improvements are obvious. Sims would have placed 26th and Cook 9th in their respective races. *2011 marks the first year all 6 county schools had a varsity team.